Hello friends! Amy here with a fun and interactive designer series project featuring the super sweet and adorable Wish Upon A Star set. To begin, I Copic-colored the stamped images from the Wish Upon A Star stamp set and die-cut them with the coordinating Wish Upon a Star creative cuts. To make the front panel and the cloud panel, I die-cut smooth white cardstock with the Wiper Surprise creative cuts. I ink blended the front panel with Distress Oxides to create the night sky. I spritzed the panel with a water-filled mini sprayer and also added white dots with a gel pen for texture and interest. The second panel was die-cut with the cloud die from the Landscape Trio creative cuts. On the panel, I heat embossed the sentiment from the Picnic With Friends stamp set in silver. 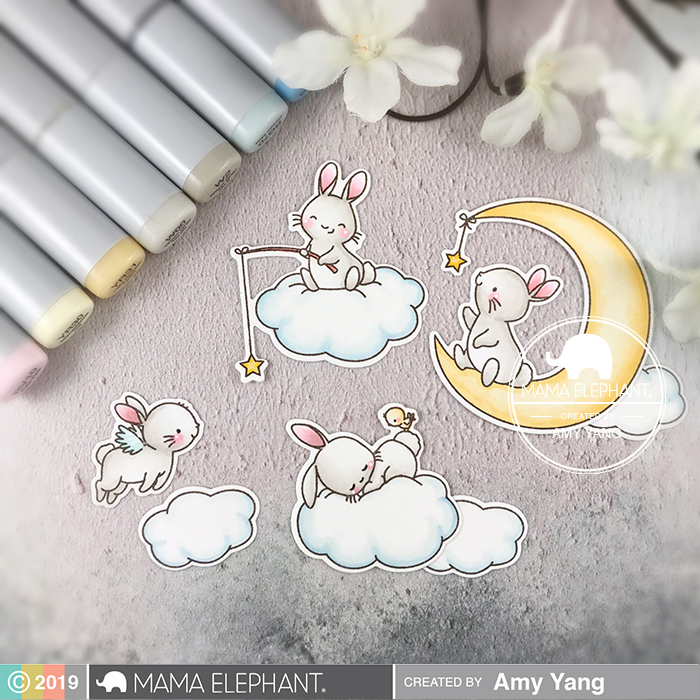 On the back of the cloud panel, I adhered the little bunny with wings on an acetate wiper that I made using one of the wiper dies from the Wiper Surprise Creative Cuts. For details on the Wiper Surprise assembly, you can watch a helpful video tutorial from Mama Elephant HERE. To finish, I adhered the cloud panel to the front panel as shown and added the rest of the colored images to the card front. To add sparkle, I glued on a few star sequins. Here's a quick video of the card in action. I hope you enjoyed my project. Thank you so much for stopping by! Happy stamping! So sweet. Looks so fluffy and soft, I might need a nap.